One of the greatest hardships as a pet owner is dealing with unwanted hair in your home. Nearly every dog or cat no matter what their age sheds. Some breeds shed more than others, but all pets will do it. While we cannot stop a dog or cat from shedding the same way we can keep a dog from flaring up our allergies, there are many things you can do as a pet owner to manage and reduce the amount your pet sheds so that it is no longer a problem in your home. The reasons why animals shed is to get rid of old, damaged, and extra hair. During the colder months, animals tend to grow a heavy coat to help insulate themselves and then shed all of that extra hair during the summer. Pets will also shed excessively when the hair becomes damaged or they become irritated from allergies. Follow the tips in this article to learn how to stop or minimize excessive shedding. 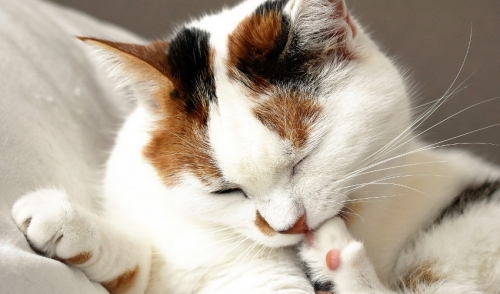 The first and most important tip of them all is to frequently brush your pet. Growing up my parents always told me to brush my dog, but it wasn’t until I was older that I noticed how much dog hair was being left behind by my dog. When I began brushing, the hair was no longer there and if it was, it was only a small amount. Brushing is by far the best thing you can do to keep your home free of hair. In addition to a cleaner home, brushing your pet’s hair will also help make your pet’s coat softer, cleaner, and unlikely to shed. There are also many types of brushes to choose from such as slicker brushes, shedding blades, matbreakers, and love gloves. Each brush has a specific function that will help you remove all of the dead hair from your dog. The second tip to manage excessive shedding is providing your pet with a proper diet. Your pet’s coat of hair is a reflection of what it eats. A dog with an unhealthy diet is more likely to shed. Feed your pet quality food that consists of digestible protein sources. You can also supplement your pet’s diet with fatty acids and fish oil to keep its coat shiny and healthy. This will keep the dogs skin from suffering from lack of moisture allowing the pet’s hair to fall out more easily. The last tip is bathing your dog regularly. Just like humans wash their hair to clean and remove dead hair, dogs require the same. Bathing your dog regularly encourages loose and dead hair to fall out into the tub instead of your carpet. A clean dog will also maintain a healthier coat and aid in removing fleas. Be careful not to over-bathe, which can cause your pet’s skin to dry out, which will increase the amount your pet sheds. If you notice your pet’s hair is still excessively shedding or your pet suffers from bald spots, see a vet as soon as possible to make sure your pet is not suffering from an undiagnosed condition. The list isn’t long, but it's very effective. Follow these tips and you will properly minimize the amount of unwanted hair in your home.